My son loves this amazing guitar teacher.. she loves teaching at our school as well as adding guitar lessons on the side. He then asked me to help him create a card for his teacher with a guitar, dogs and music... well, I don't have a guitar stamp but puppies, music... I have! Check out what we created and let us know what you think with a comment! I could just see her beagles running amuck on a sheet of music so this is what we created! With Basic Black card stock (#121045) as the base, the Modern Medley (#126926) Designer Series Paper is framed on the front, set in 1/8" in on all four sides. Prep your Vellum Cardstock (#101856) with the Embossing Buddy (#103083) before you stamp this cute Storybook Friend (#126737). Having stamped the same image on a sticky-note and cut it out - it can now cover and 'mask' so that there are two pups running about. stamp so that one is behind the other - chasing and having fun! 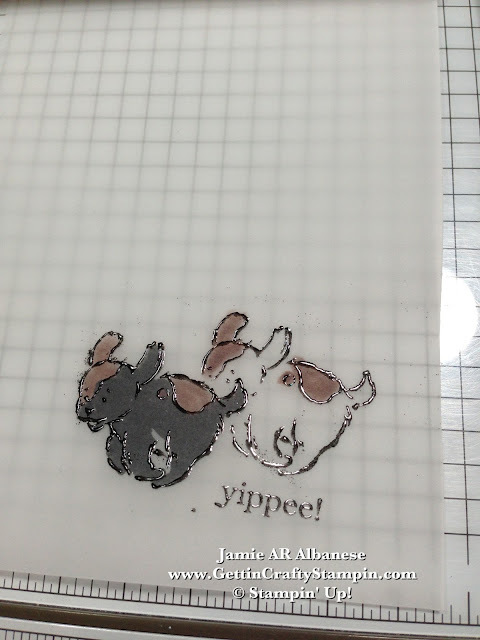 Cover with the Black Embossing Powder (#109133) and heat set with the Heat Tool (#129053) for this sharp image of two dogs having fun! 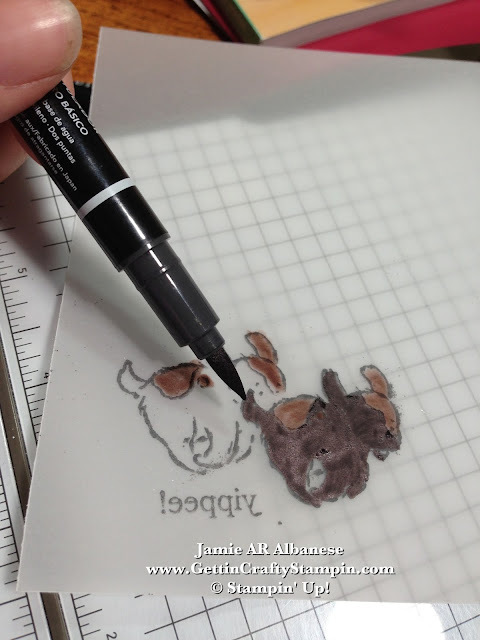 FLIP the page over and color from behind using our Stampin' Write Markers (Neutrals Collection #131261) to mimic the coloring of her beagles. With black bodies, brow spots, white tummies.. painting from behind still allows the black embossed image to shine on the black colored in body. Aren't they just too cute? Two Pups having too much fun! 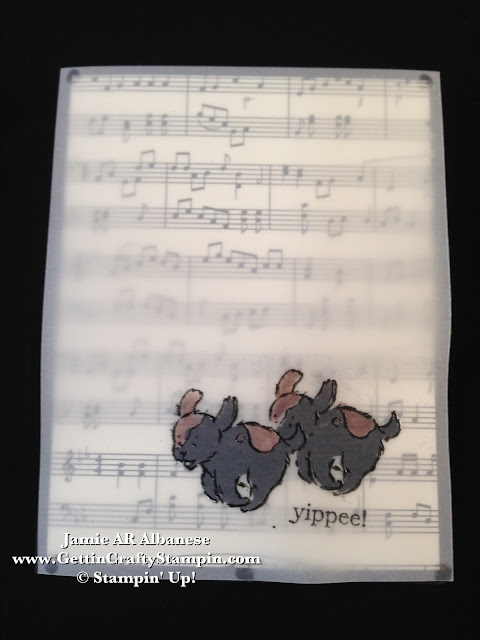 Layer this paper over the Modern Medley page that is adhered on the Black card stock using our Glue Dots (#103683). 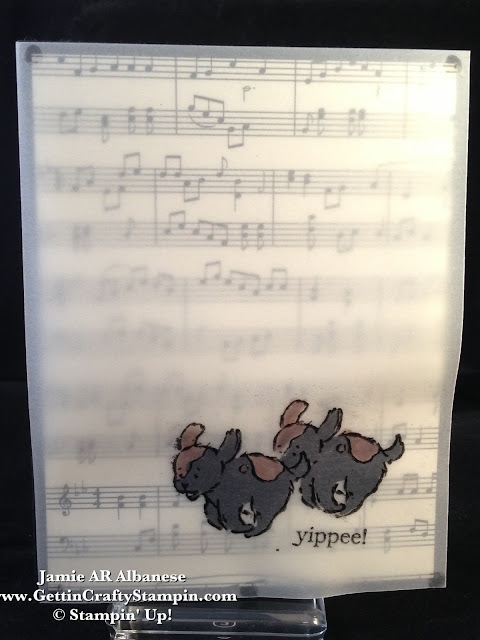 They are now having fun running among the musical notes. My boy loves his lessons, his amazing teacher and her sweet dogs. I love that he wanted to create her a card to thank her for her love and making it so fun! (Maybe I'm not failing as a mom, after all - lol). 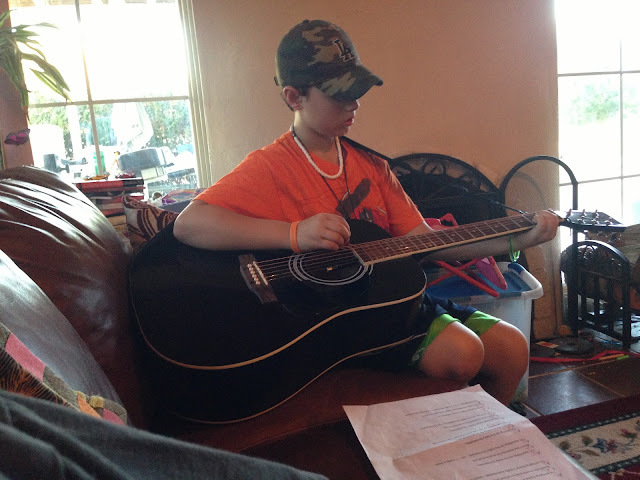 Here he is enjoying his practice time, getting ready to make her proud! Thanks for coming by... Leave us a comment and let us know what you think. I'm not a secret - lol - so please SHARE ME... Pin, Email, Google+, Facebook, Tweet, YouTube, Instagram, LinkedIn, Foursquare.... and JOIN ME on those channels, too! Lessons are a GREAT Way to Build One's Skills! 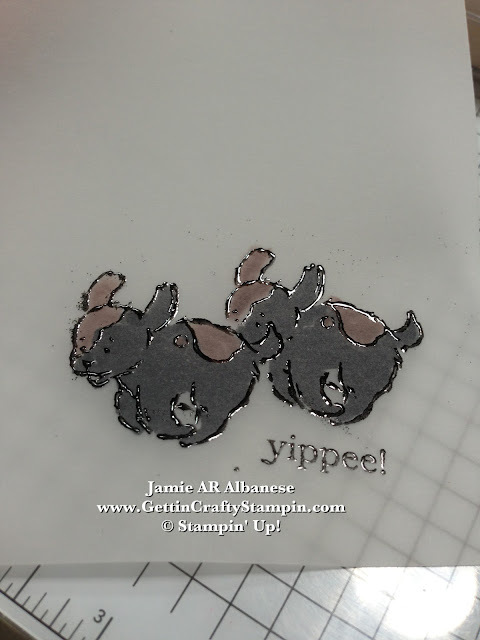 Join me for my Classes, Gettin' Crafty Stampin' Mailing List, Virtual Club and more! Have FUN while you Learn great new techniques. Remember that I post daily, so come by and visit often... sharing me with your friends and family!